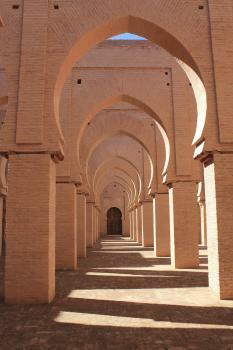 Mosquée de Tinmel is part of the Tentative list of Morocco in order to qualify for inclusion in the World Heritage List. The Tinmel mosque (indicated as Tin Mal on google earth) is located in a valley about 1 and a half hour from Marrakesh along a magnificiant road in the Atlas Range. It is clearly indicated at the end of a short side dirt road. The entrance is about 1 euros, to give to the guardian, who will helpfully give explanations about the site, if asked. The mosque had been constructed in 1156, at the height of the Almohad power. After the decline of that dynasty, the surrounding town was destroyed by the next dynasty, safe for the mosque. The building can be seen from far, with massive walls. The interesting part is inside, with all the arches richely decorated. Nowadays, the roof has disappeared, leaving a magic blue sky above one�s head. There is a plan to rebuilt the roof however. Further up the road, don�t miss a chance to go to the Tizi N�Test pass, with great view down on the valley below. It makes a very nice day trip from Marrakesh (or from Agadir).